My name is _________ and I am a 32 year old 7th generation lifelong member of the church. I served a mission in the Brazil ___________ mission. I have been a primary teacher, nursery leader, counselor in the presidency of a couple of elder’s quorums, and elder’s quorum president a few years ago. I believed in and trusted this church completely. I was devoted. Most of my dearest friends and my family are Mormon. I continue to attend LDS meetings every Sunday. Last July, I saw some headlines about some DNA testing being done to determine if certain people in history were offspring of Joseph Smith. I read the article and determined that I really didn’t know that much about Joseph Smith’s life. I decided to find out more by reading the Wikipedia article on Joseph Smith. That article, through its sources cited, led me to vast amounts of information on Joseph Smith. I learned that there were several things that Joseph did that were out of harmony with the current teachings of the church, but the most surprising to me was his lack of honesty(1) in bringing forth the principle of polygamy. In discovering many unexpected things about the history of Joseph Smith and many other church leaders, I felt a profound breach of the trust I had placed in the church. I cannot describe how painful this was to me. The more I read, the more apparent it became that the version of history taught at church is very one-sided and whitewashed to promote faith. It felt like these things were purposely hidden from me and that I had not given informed consent in my church service and in the covenants I had made. Honesty is important to me. I have set as my ideal the teachings in the current Gospel Principles manual(2). I have not always been perfect in this regard myself, but I believe a just God would give us prophets and apostles that would be humble and truthful on points of doctrine and would admit frankly when they don’t know something. It hurt to read and hear lies and misrepresentations straight from the mouth of Joseph Smith(1), John Taylor(3), Gordon B. Hinckley(4), Jeffrey R. Holland(5), and others. Still, this would be excusable had they repented as outlined in the modern teachings of the church. However, to my knowledge they never did. I had a conversation with a good friend of mine who is currently a bishop. We spoke of how it is difficult to apologize to a child even when we are sure we have wronged them. Something about human nature makes it difficult to make that apology when we have authority over someone. I recently listened to the apology of Henry B. Eyring for the Mountain Meadows Massacre(6). What beautiful words. I think this has been wonderful for allowing us to move forward from this tragic event. I have also been studying the history of the priesthood ban for blacks and while the church maintains the position that we don’t know where the ban came from, I think it is quite clear that it came from the racist attitudes and common racist protestant doctrines of the time, especially when coupled with Brigham Young’s support for and instrumentality in making Utah territory a slave territory(7). Slavery and racism have no place in the true church of God. A real apology could work wonders on putting the issues of the priesthood ban and church support of slavery behind us. At this time, my level of participation in the church is minimal. I am there on Sundays and that is about it. I don’t think that there are any good answers to the moral questions I have about early church history. I have looked hard for them. However, there are some changes that could be made in the church that could lead me to want to participate more fully despite my issues. I don’t presume to be in a position to tell you what to do. I am writing to make my opinion known so that it can be considered. Current temple wedding policies also create problems for me. On one hand, in countries where it is required by law, couples can marry in a civil ceremony and can be sealed the same day. In the United States, having a civil ceremony earns the couple a one year waiting period. It seems to be a policy with no scriptural basis that can be waived when inconvenient. I don’t see how including all family and friends in this joyous occasion could be anything but good for everybody. The problem that I see is that I correspond with people on the internet that admit to lying to go to the temple and see friends or relatives get married. I don’t agree with doing this, but they would not feel it necessary to enter the temple unworthily if the couple could have a civil wedding beforehand to include those who can’t attend the temple. Frankly, this policy creates feelings that the church cares about money first, since many of these unworthy people who otherwise don’t pay tithing are required to pay tithing for a period of time before they can get a recommend. I have corresponded with individuals who pay tithing for the sole purpose of attending temple weddings. I really want to believe that you want unworthy individuals to stay out of the temple and that money is not the reason for this policy. The BYU Honor Code is another policy that I have a hard time understanding. The policy does not allow for a change of faith(8). I am far from alone in my crisis of faith. Many BYU students share my experience while they are enrolled. They are placed in a position where they cannot be honest about how they feel for fear of losing all that they have worked for in their education. The situation encourages them to lie and compromise their integrity. In my opinion this policy shows utter disrespect for our God-given agency. Please change it so that people who lose their faith in the LDS church can get a new ecclesiastical endorsement from a minister of another faith. The stance of the church with respect to gay marriage is ironic when you look at history, considering the fact that a lot of the arguments that the LDS church is using against gay marriage were used against it almost verbatim when it was fighting to legalize polygamous marriage. It is becoming increasingly clear as scientists research the subject that being gay is not a choice. The only logical thing for someone who is born gay and does not share the beliefs of the LDS church is for them to want to marry the person they love. I don’t believe that it will harm my family or marriage in any way for them to do so. I also do not agree with the church directing bishops to interview children alone behind closed doors. I will not be allowing my children to be interviewed by the bishop or his counselors without my being present. The potential harm that a rogue bishop could do here is too great. The issue is not just the potential for sexual abuse but for ecclesiastical abuse, unnecessary shaming and guilt, etc. Also, a false accusation could ruin a bishop’s life as well. I wonder if there is a better way for the goals of the church to be met that doesn't involve such a risky situation. Anyway, thank you for taking the time to read this letter. There is no need to forward it to my bishop or stake president as they will not be able to assist me with any of these issues. - Joseph Smith, May 26, 1844. At this time, he had about three dozen wives. (2) “When we speak untruths, we are guilty of lying. We can also intentionally deceive others by a gesture or a look, by silence, or by telling only part of the truth. Whenever we lead people in any way to believe something that is not true, we are not being honest. “The Lord is not pleased with such dishonesty, and we will have to account for our lies. Satan would have us believe it is all right to lie. He says, “Yea, lie a little; … there is no harm in this” (2 Nephi 28:8). Satan encourages us to justify our lies to ourselves. Honest people will recognize Satan’s temptations and will speak the whole truth, even if it seems to be to their disadvantage. “People use many excuses for being dishonest. People lie to protect themselves and to have others think well of them. Some excuse themselves for stealing, thinking they deserve what they took, intend to return it, or need it more than the owner. Some cheat to get better grades in school or because “everyone else does it” or to get even. “ Inasmuch as this Church of Jesus Christ has been reproached with the crime of fornication and polygamy, we declare that we believe that one man should have one wife, and one woman but one husband, except in case of death, when either is at liberty to marry again." - John Taylor debate in France in the summer of 1850. In the second paragraph, Taylor quotes from the Book of Commandments which was not being followed by church leadership at the time. Taylor himself had a number of plural wives at this point. He later published this debate and distributed it in England to aid in conversion efforts. -Gordon B. Hinckley, Interview with Larry King September 1998. He states that polygamy is not doctrinal (we still practice it in the temple and it appears in the Doctrine and Covenants) and that we don’t practice it because it is against the law. However, in all the time that the LDS church practiced polygamy, it was never legal. (5) “S: As a Mormon, in the Temple, I’ve been told, [Romney] would have sworn an oath to say that he would not pass on what happens in the Temple, lest he slit his throat. Is that true? J: That’s not true, that’s not true. We do not have penalties in the Temple. S: Therefore he swore and oath saying ‘I will not tell anyone about the secrets here, lest I slit my throat’. (6) ”The gospel of Jesus Christ that we espouse, abhors the cold-blooded killing of men, women, and children. Indeed, it advocates peace and forgiveness. What was done here long ago by members of our Church represents a terrible and inexcusable departure from Christian teaching and conduct. We cannot change what happened, but we can remember and honor those who were killed here. – Brigham Young, speech given on February 5, 1852 to the Utah Territorial Legislature. Later that year, the legislature voted to make slavery legal in Utah Territory. The legislature was made up primarily of General Authorities of the LDS church. To be fair, Young did advocate for better treatment of slaves than they were given in the south. I wish you well on your journey, no matter where you end up being led, you have support! I do find it crazy that Mr. Snow had no direct response, but instead reverted to the basic answers, as if you haven't been. Thanks, Sam. I think I have arrived at "The Golden Rule", and I think I'm going to stay here a while. Mr. Snow didn't give you any answers because he has no answers. The church leaders have been caught with their pants down and now want us who have caught them to continue to pretend the emperor has no clothes. It might of been better had he not responded at all than to respond and not have any clear answers but to have faith. Faith in something that can't be disproven is faith. Faith in something that is verifiably false isn't faith, it is delusion. Better to trust your own heart than that of any bogus religion (all of them). Every man and women, deep in their hearts, realizes that the whole thing is a huge crock of hooey. The nonexistent and the unseen share remarkable similar qualities (McKown) There is no galactic justice, it's just us Enjoy. Faith is what you use to help you believe in things you know can't be true. Once you toss it aside, whatever 'comfort' you had in the fairy tales will be replaced by the good humor of watching all the rest of the people who haven't caught on yet as they wallow around in the shallow waters of faith in search of deeper meanings. What is the meaning and purpose of life? I dunno, but what I do know is that there isn't an HONEST man on the planet who has any better grasp of it than I do so when I see those who make claims otherwise it's a lot simpler to spot the charlantanism. This is not a Mormon specific rant. Everyone is an atheist to everybody else's religious beliefs as well as all the Gods who have already fallen prey to the atheist mobs (Mars, Poseidon, Mithras, etc. ad nauseam) The only difference between me and all the other near-atheists alive today is just the ONE left standing naked on the mount. And it's not just Joe Smith that worked the deception to a tee. It's not widely known that EVERY miracle attributed to imaginary Jeebus was well documented as having a previous analogue in the existing Gods of the era. Pick one. Walking on water. Rolling away the stone, healing, raising the dead. rising after three days.... Seriously. Do a LITTLE deeper research than just that involving Smith and you'll quickly see the whole house of cards tumble down. The God Who Wasn't There is on Youtube in it's entirety if you wish to waste an hour educating yourself on things that the Church has been suppressing from our educational curriculum for a couple centuries. If you prefer reading? Try Thomas Paine's Age of Reason. If you like comedy? Chase down Samuel Clemens "Letters From Earth", so controversial it wasn't released unit the communist Soviets shamed the dead writer's family into releasing it lest they be guilty of the charge of 'covering up the truth" by the freakin' commies themselves!! Anyway, there's no guarantee of anything and the best you can do is live your life as an example that would make your children proud. This isn't a dry run for some future fantasized utopia. This is the only one you got. Trouble imagining perpetual death? Lack of imagination. How did it 'feel' for the thirteen odd billion years before you were even born? It'll be just like that. Promise you'll R.I.P. #funwithatheism Enjoy. I am in awe, as the churches lies and manipulations are being rejected by so many. But, rest assured ye of faith, as soon as the new mormon history museum is updated to make the lies a bit less obvious, your faith in the lds bank accounts will be sustained. Michael Scott "Wikipedia is the best thing ever. Anyone in the world can write anything they want about any subject, so you know you are getting the best possible information"
Wikipedia is about the best free encyclopedia out there, but you won't see me citing it in a presentation at work or anything. 'Nullius in Verba' applies to Wikipedia just as well as anywhere else. The problem with Wikipedia is its not peer reviewed. And even if an article is peer reviewed still doesn't mean it's worth anything. There is a reason why the New England Journal of Medicine is given more credible weight than say Bobs American Journal of Surgery and Fishing. The article you posted is thought provoking and I did follow the other links that were there. I thought the reply from the church historian was appropriate. I believe the church will come out addressing a lot of what's on the Internet. Bottom line is religion is not like other fields as say medicine where we use evidence base science to prove things. I think if something makes you a better person, spouse, parent, citizen, son or daughter then more power to you. Thanks, Ryan. More power to you as well. We could all use more understanding of others. I didn't have any problems with the church historian's response. His suggestions didn't ultimately work for me but I think he wrote in good faith. As far as Wikipedia goes, I thought I was pretty clear in the letter that I only began my investigation at the Wikipedia article. That was where I started. At the bottom of the Wikipedia article on Joseph Smith was a list of references. That got me started reading works by Bushman, Compton, Hales, Van Wagoner, Newell+Avery, Quinn, and the Journal of Discourses. I didn't go into the specifics of what bothered me of what I found in those books in the letter that I wrote and featured in this post, but I do that in my previous blog posts. You are welcome to read and comment on the specifics. I'm open to the possibility that I have gotten things wrong and I don't mind friendly exchange of ideas, even if I don't agree. I discovered this blog entry two years later (February 2016). 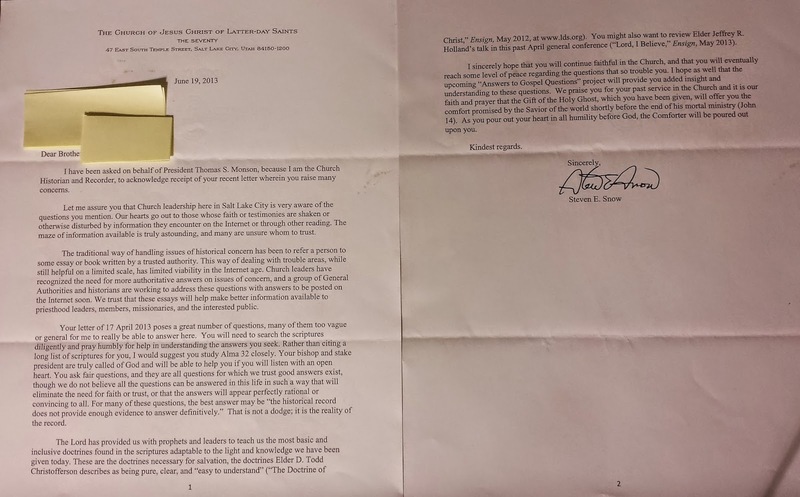 As a 60 year old, my Mormon shelves collapsed finally after reading the "essays" Brother Snow is promising here. It turns out those essays are nothing but carefully worded deceit. The essays did not answer my questions (or your questions). The essays confirmed to me that all the questions and problems I had were legitimate. The essays provided me with the strength to give myself permission to finally leave the Church.